Two NOTD today, as they came in a great duo pack. Let me ask you a question. When you're going on holiday and you go through the security gates and are sat plonked in the duty free...you have to have a wander, right? Right. So me being me made a beeline for the beauty area...in particular any polishes. Ah ha! I spotted an OPI stand. Gorgeous colours on there, not very up to date, but still a few i'd love. No prices. So i asked. £12.50 EACH. I was kinda floored...that's more than what you pay in Sally's or some other OPI sellers!! Needless to say, i put them right back, making a mental note of which ones i liked to get them upon my return. What on earth has happened to Duty Free!?? You used to get some fantastic bargains from there, but now they're just as much as High Street price...sometimes MORE!! Anyway...onto the duo set i got! I got back (had to ask help for one name id forgot!) and started a search. Was pleased to see them in a special set together.....prices varied but i was chuffed to find it at Beauty Expert for a fantastic £12.49 with free delivery!! Bargain! Also got a free very sparkly looking pen! My personal favourite of the two has to be the Ink - its just a luscious dark purple with what seems to be an almost holo small pieces of blue and light purple running through it. Both polishes had a base coat of Opi Nail Envy, 3 coats of the Opi Polish and a top coat of China Glaze Patent Leather Top Coat. Opi "Yodel Me On My Cell"
As is pretty much the norm with OPI polishes, went on great - i found the best way was to have a medium coat, so not too thin, and not too heavy, but when you put the brush on your nail, there's some that goes on and can be spread along the nails in one go. It tends to dry very quickly if you do thin coats, so this prevents any snagging of previous polish applied. Touch dry within a few minutes, but again, as with most polishes, not just OPI, id give it 30 minutes to make sure you don't knock or chip the fresh application. 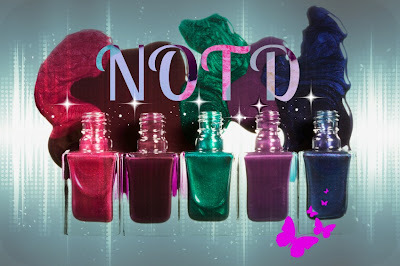 I loved these polishes! Lots of colour, lots of glitter AND a super glossy coat, even without the top coat! This is each polish with 3 coats and the top coat. You can see the glossy shine and the really striking colours! "Yodel Me On My Cell"
I love both these colours, but the purple has a fixed place with me! These have re-kindled my love of OPI's as i haven't had them on for a while, as, its pretty well known, i do love my Indies, and i sometimes forget about the large brands, but they do some great colours as well, so don't forget about them!! Whats your favourite OPI colour and why? Should i get it? Would i love it? lemme know! !